You'll see instant ramen noodles in a whole new light after trying this delicious presentation. Cut beef steak lengthwise in half, then crosswise into 1/8-inch thick strips. Combine seasoning from ramen noodles with cornstarch mixture in large bowl. Add beef; toss. Heat 1 tablespoon oil in large nonstick skillet over medium-high heat until hot. Stir-fry broccoli and carrots 1 minute. Add noodles and 1-1/2 cups water; bring to a boil. Reduce heat; cover and simmer 3 to 5 minutes or until vegetables are tender and most of liquid is absorbed, stirring occasionally. Remove; keep warm. Heat remaining oil in same skillet over medium-high heat until hot. Drain beef, discarding marinade. 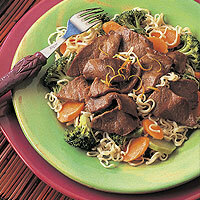 Stir-fry 1/2 of beef 1 to 2 minutes or until outside surface of beef is no longer pink. (Do not overcook.) Remove. Repeat with remaining beef. Serve over noodles. Sprinkle with orange rind.